I have not written a blog post in so long that I can’t remember when I last wrote. I have kept up busking and working for my friend Elaine. I even painted a couple of new paintings this spring. I continue to be interested in eating clean food, while Monsanto contaminates the food supply with glyphosate and who knows what else. If I grow my own food organically, I know what has gone into it. For a few years I have grown kale and chard, butternut squash and tomatoes. Last year I added Thai basil. I’ve grown beans before, mostly to fix nitrogen in the soil: although I love fresh green beans, the aphids loved them, too, so I plant scarlet runner beans to go with this year’s emerald dent corn. After severe drought, California got rain in 2017 and I am able to start thinking about planting trees and shrubs in my no-shade yard. 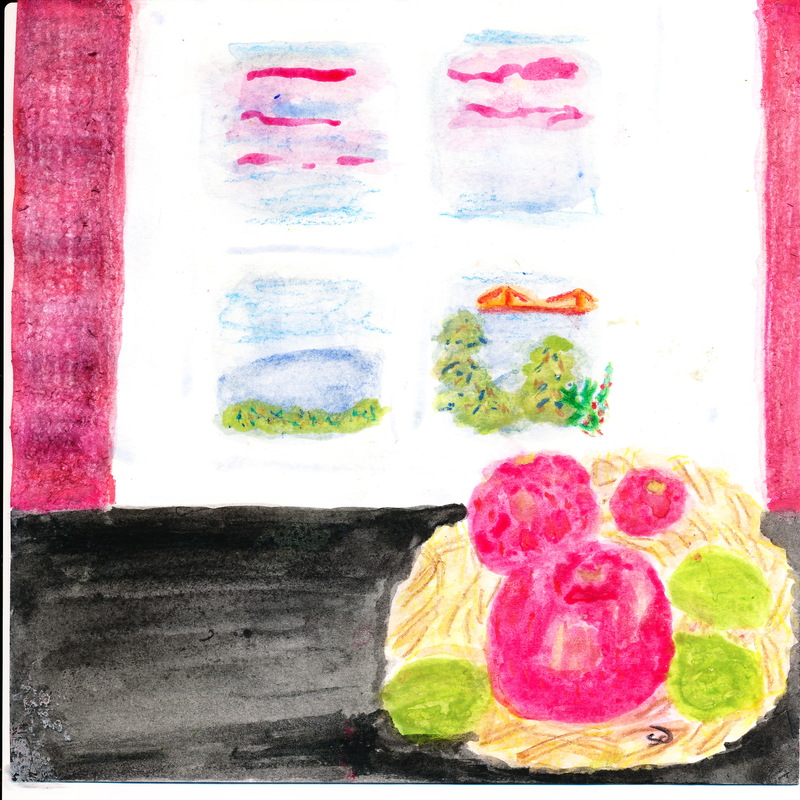 I dream constantly about peach trees, a Fuyu persimmon to shade the patio, a pomegranate, a kadota fig tree, apples and blackberries and raspberries, a Meyer lemon. I have been studying books on backyard orchards and radical pruning to keep trees to six feet. At the same time I dream of home-grown fruit and relieving shade, I see every eyesore and obstacle in my yard and work to transform them. I have neither money to hire work done nor funds for trellises and pavers — I want what I have to spend to go for trees and vines. I am neither handy or particularly strong, having been disabled from birth by cerebral palsy. I am good, however, at finding alternative ways to do things. Lately, I have been finding objects. Today I dragged this old box spring three quarters of the way down my street because the wood framing looked like a trellis to me. Or a raised bed. 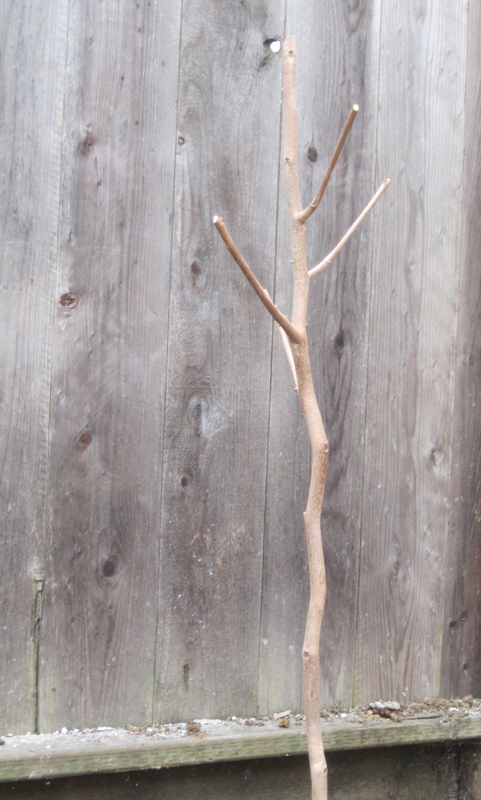 A kindly neighbor carried it into my backyard and leaned it against my fence where it awaits its transformation. I build a compost heap in a rotting stump to speed decomposition because the stump occupies the area where I want my persimmon tree. I scavenge large sheets of cardboard to solarize the weeds in the side yard where I think the berry patch is going to be. Whenever I get stuck, I just ask myself, what can I do? There are weeds to pull and tomatoes to pick and cardboard to bring home, seagull feathers to pick up from the ground to fold into the compost bins. 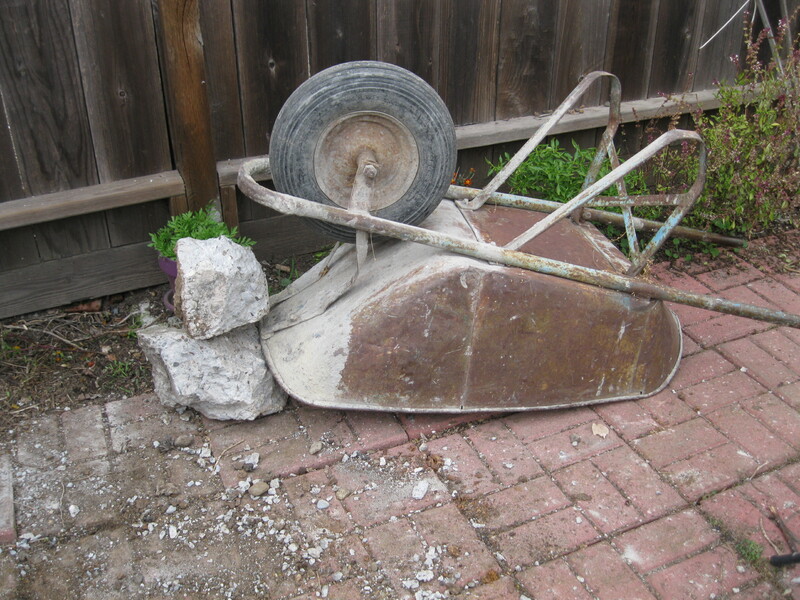 It isn’t planting season yet, but there is time to disrupt weed growth, to make worm tea, to find garden tools at Berkeley’s Urban Ore. The corn is growing and someday, despite my impatience, I will have garden fruit. Summer of 2015 was all about tomatoes for me: the forty-some volunteer tomato plants sprang from seeds of fallen tomatoes I planted last spring. They grew, blossomed, played host to myriad aphids and, in spite of that, produced more tomatoes than I have ever had to work with, mostly cherry tomatoes and a drying variety called Principe Borghese. All July and August I picked them, washed them, dried them, put up vats of pasta sauce in the freezer. I made experimental tomato sugar plums. I considered making tomato caramel. We ate them in Greek salad and BLTs. I developed two versions of a pasta using pan-roasted cherry tomatoes and fresh corn with either andouille or chicken chorizo (The Mexican version is my favorite). The only thing I didn’t do is can them — we don’t have a dishwasher and I don’t have a canning kettle or a living grandmother to show me all of the old-fashioned tricks for canning in a simple kitchen. The summer ended with a week-long heat wave. I watered the plants on the first day and then they were on their own because it was too hot to venture into our unshaded yard. Last weekend I cut the abundant dry weeds from the side yard, probably twelve or sixteen grocery bags of them. Some of them were taller than I was. That felt like a fall chore. Then, yesterday, I sang at the Farmers’ Market in Berkeley. It was a fall market all of a sudden. There were strawberries, but not enough for everyone who wanted to take them home. There were a few peaches left, but more pears. And there were apples everywhere — I bought fifteen pounds of mixed varieties for ten dollars and cut down a cardboard box so that I could shove them in my refrigerator to join the bowl of Gravensteins I bought for pies a few weeks ago (It has been too hot to turn on the oven). I do not know the names of all of the apples I got, or the flavors and textures: lunch today may be a hunk of bread, pieces of cheese and slices of different apples. My new favorite, identified by the farmer who sold me the mix, is a Royal Empire, a mid-season apple: they taste exotic, spicy, and have plenty of juice and crunch. The tomatoes are still producing fruit and blossoms. 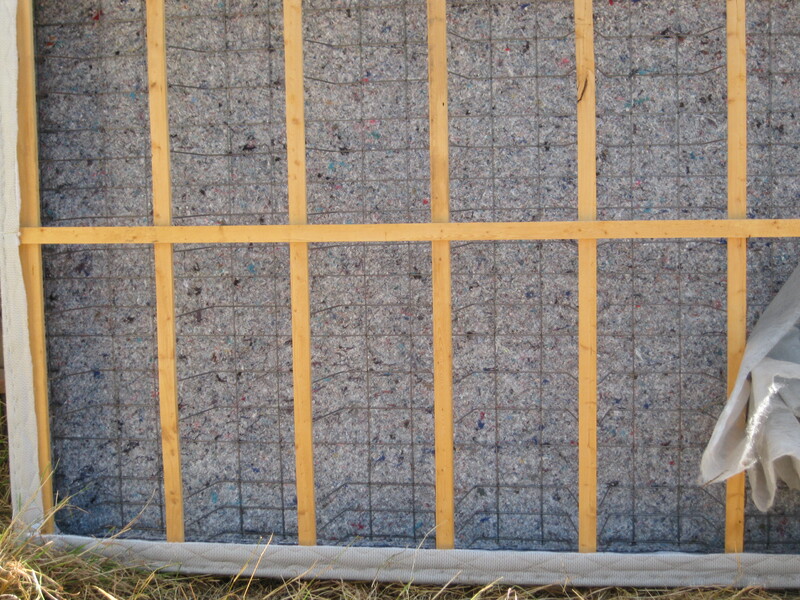 I begin to think of drying more of them, running the dehydrator at night. I also begin to think of soup, perhaps a corn chowder with the last of the sweet corn, or a butternut squash soup from last year’s squash — I still have a few in the garage. 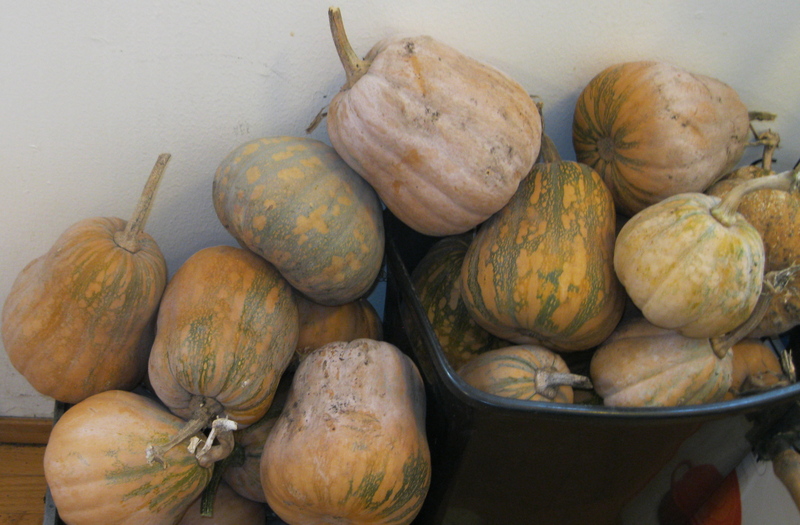 Perhaps I will cook them all and store the puree in the freezer for easy fall and winter soups. I freeze the seeds and skins, too, for stock. I am not assured of cool weather. The weather is the wild card in California. Four years of drought. Record heat. There are clouds in the sky this morning, which means it will not get as hot as it otherwise could, but it has been a crap shoot whether to turn on the oven for months — as soon as I make pie crust, it turns too hot to bake. Make iced tea and we will have a cool day and I will get out the tea pot and drink hot tea instead. I have taken to watching the news on TV just to hear what they are saying about the weather. It is dark later in the mornings: soon I will begin my walk to BART in the dark. It is dark when I get up now and the light fades early. I don’t remember dark mornings coming in early September, but I guess they do every year. I do remember the food transitions. Right now I have lemons, peaches, Armenian cucumbers and red bell peppers, plus all of those apples. I did not cook last week, living on milkshakes, smoothies, the occasional Greek salad and canned re-fried beans. Yes, I stock those for emergencies, hot weather and days when I am too tired to make my own from dried pintos. I think I should make some roasted strawberries for Johnny for the winter if I see strawberries next week. When I was writing this post last, it was becoming fall 2015. Now it is spring 2016 and volunteer tomatoes are up in the yard, along with lots and lots of chard and kale that re-seeded themselves (I don’t mind at all — they compete with the weeds). I have three butternut squash plants — I threw a rotting squash from 2014 into a heavily mulched area and, voila, new squash plants. We are eating fresh strawberries again and lots of fresh salads, which helps us both in our efforts to lose pounds we accumulated over 2015. I am baking sourdough bread once more. My latest quest is to eat “clean food” — i.e. food not touched by the industrial food system. For now we have given up white sugar and most white flour. We use maple syrup and dried fruit in our oats. We eat polenta. I use commercial whole wheat and rye flours in bread, with just a little bread flour, but I am on the track of a freshly-milled whole wheat flour. Although I miss cheese and pasta, I do buy some organic milk and yogurt from a dairy farmer. We eat a lot of legumes, too, and wild-caught shrimp and fish. Eating less sugar was the big surprise. My skin improved. My gums improved. I still daydream about good desserts, but fresh fruit tastes really good when it is ripe, local and seasonal, whether it is strawberries or blood oranges. Dried fruit offers other options. Sometimes I will have yogurt with fruit and honey. Right now I am enjoying the freshness of a lot of things we eat: today my lunch was a salad of watercress, lettuce, cilantro, roasted beets, raw carrots, walnuts, feta and blood oranges in a balsamic vinaigrette. I have had a left knee injury since December 2015, which is slowing me down and keeping me from things I like to do, but I found this draft post and thought I would send it out to all my patient readers to say that I am alive, still feeding us and growing things, still playing music, not painting much or writing much, watching the seasons turn through the plants in the yard and the food on our plates. Last time I posted here I was admiring the volunteer forest of tomatoes that had sprung up in the backyard. I even sat out there one day and tried to capture what it felt like to sit in the tomato forest. I treated it as a forest, too, left the understory on the ground. 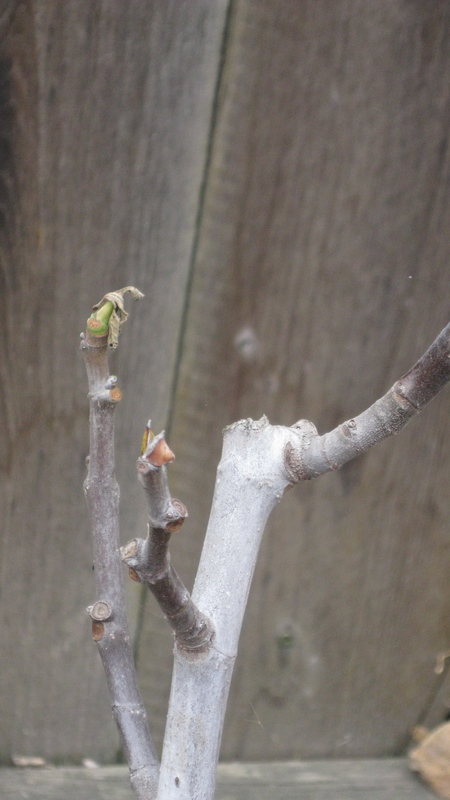 I did clip out non-bearing branches quite often, and the plants produced new shoots as soon as I could clip them off. I tended the chard, giving what water I could save from boiling pasta and washing vegetables. I watched the kale flower — I don’t care much about this kale, a gray-green variety that a friend gave me, so I was not overly concerned. I should have been concerned. I did notice when I went out to dole out water to the chard that the kale was alive, shimmering with pests, but I didn’t care if the pests took down the kale plant. My chard was healthy and kept making new chard plants. One section of tomatoes had beautiful crowns of blossoms three feet above the ground. I began to think we might eat our first ripe tomato by the last day of May. We did. We cut it in half and had a little ceremony for the first fruits of the summer. Later, after a rare rain and some cloudy days I noticed white specks in the tallest section of tomatoes. I thought it was mildew brought on by the damp. I hoped for sunny weather to dry it out and was not concerned. I should have been concerned. The white specks turned out to be aphids and I am now battling to save what I can of the tomato plants. I prune them savagely, losing unripe tomatoes and blossoms with every cut of my shears. I save bath water, impregnate it with organic lemongrass soap and blast away for hours at the besieged plants. 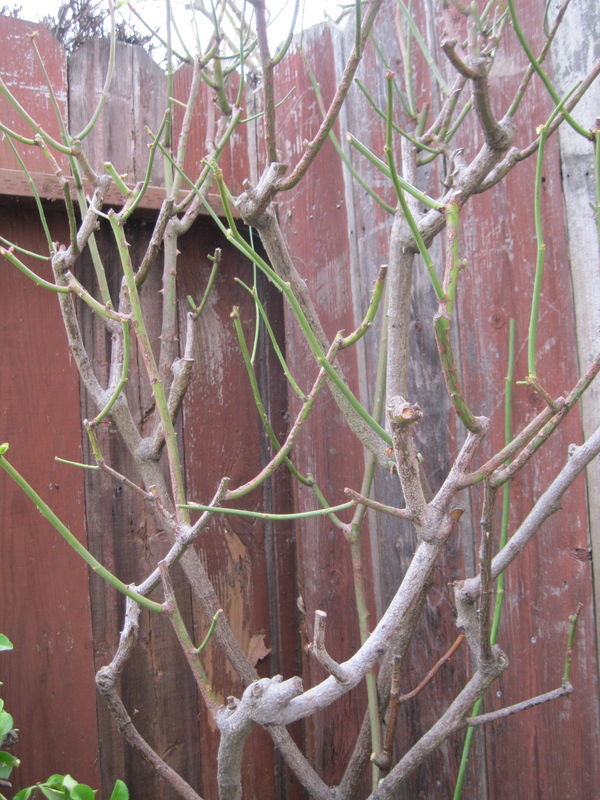 I toss the prunings into an old pot with waste water, submerging them to kill aphids and eggs. I pluck every yellow or brown or decayed leaf from the ground, clearing the understory of aphid hiding places. I was out there many hours Monday and yesterday afternoon. And then I had to take a break. I was exhausting myself and the aphids were continuing to spread and reproduce. I looked up various remedies. I knew lady bugs ate aphids. I found out that it takes 1500 lady bugs to clean the aphids off one plant, that they usually fly away within forty-eight hours and you usually need two batches just to be sure. Lady bugs were out, unless I could buy them by the truckload. Hard sprays of water from a hose are supposed to blast aphids off the plants. We are in a major drought here and only water with waste water. We do not have a gray water system. Using a hose is out. It’s up to me and my clippers and spray bottle. Sigh. But then today I woke up to steady rain! Rain! Not only would it strengthen and nourish the plants and soil, but aphids hate it. After a late breakfast I found myself out in the garden with my clips and sprayer, dressed in a shift and a pair of old sandals, enjoying the rain on my skin. I worked for nearly three hours, worked until my back could take no more. I came into the house, thinking I would have lunch. Instead, I drank two quarts of water and headed back into the rain to treat more branches. I worked again until I could work no more. I hung my soaked shift in the bathroom and put on a robe. I had a belated snack of leftover cornbread, a few tomatoes and two cups of tea. I had promised Johnny an early dinner, so I could not linger out in the garden. Now the rain has stopped, but the battle will continue. My mistake was in not seeing that everything is connected. The aphids that were destroying the kale would move to the tomatoes, or the conditions that were producing a banner crop of aphids that feed on kale could produce tomato-eating aphids, too. My second mistake was not investigating the first white specks more thoroughly, not turning leaves over to look. By the time I realized what was there, the infestation was in full swing. My yard gave me the tomato plants, more than I would have ever planted on my own. I envisioned a bigger crop than I have ever had. with tomatoes for drying. for pasta sauce, for eating raw, tomatoes for my friends and family. So far, I have delivered half a basket of green tomatoes to my friend Elaine and we have half a basket of ripe cherry tomatoes on our kitchen table. There are many green tomatoes still on the vine and many months left in tomato season. There are only so many hours a day to devote to aphid warfare, however, and I don’t know what I will save. I think of my friend Celi, a full-time farmer. She has lost animals and bees and, undoubtedly, plants as well. She is growing her own food. I am trying to grow some of mine, tomatoes and chard. I’m still using last year’s butternut squash from this very garden. I admire anyone who grows organic food successfully. I read about plants aphids hate and think perhaps I will plant mint everywhere (I have one small pot of it). Maybe I can learn to propagate mint plants from stem cuttings. Just two weeks ago I was admiring the indefatigable tomato plants, producing shoot after shoot. I was thinking that they were teaching me how to continue in all circumstances. I could just as well admire the indefatigable aphids, who only want to live and reproduce, but I’d rather have tomatoes than aphids. Hello. It is the last day of March and I have moved again: on March 21 I moved out of my mother’s house and back to San Leandro. I am still unpacking things and rearranging them — I can’t remember where everything went last time around, although I remembered the locations of all of the pieces of furniture. As I settle into the house and take up routines of cleaning and cooking I find myself thinking a lot. These are the kinds of things I think. “I want to make some bread. I don’t have any whole wheat flour. I have oats and cornmeal and molasses and white flour. I can make anadama bread. If I make double amounts of the cornmeal mush we can have cornmeal pancakes for breakfast tomorrow. If the oven is on to bake bread, I should roast a butternut squash from the cache that I grew last year. We can have that tonight with baked beans and fresh bread.” Then I bake bread and roast squash, saving the squash innards in the freezer for some future batch of butternut squash soup. Using the oven to prepare more than one dish at a time is something I learned from my mother in her kitchen. I think about the garden. Because I am going on a short trip to New Mexico in late April I do not want to start seedlings or plant anything new outside until I get back. The garden, however, had plans of its own. Forty tomato plants have started themselves from the smushed remains of last year’s tomatoes, tomatoes that fell off the huge Sun Gold vine. Many of them decided to grow between the tiles of the only paved area in the yard, although some have reasserted themselves in the soil by the fence where I planted them last year. The largest of the patio tomatoes is now in flower. We will have to wait to see what we get because Sun Gold tomatoes are hybrid tomatoes. I had also planted Amish paste tomatoes and Principe Borghese. It remains to be seen if any of them have come up in the tomato forest. 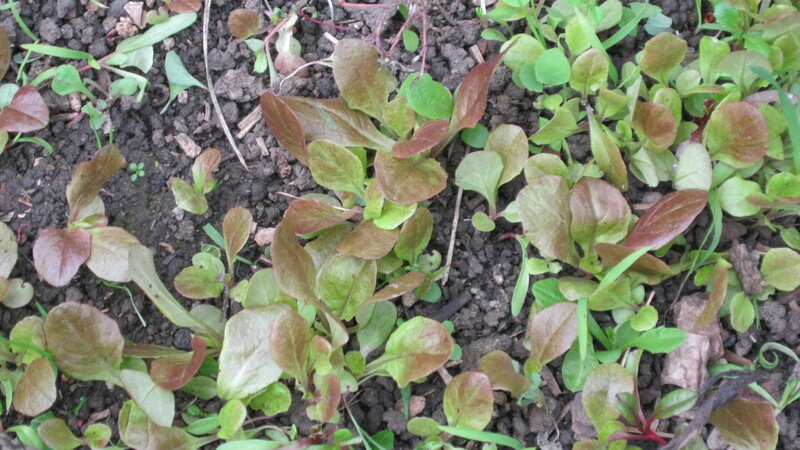 The chard asserted itself as well and formed two healthy clumps in a boggy area near the shed. So far my gardening activities have been limited to weeding, cutting down dandelions and thistles and teasing out oxalis from the stems of the chard. I cut chard everyday to eat, adding it to pasta with sun-dried tomatoes, kalamata olives and feta or scrambling it into eggs with scallions. I think, eating from the garden, that I would like to plant some lettuce soon, maybe some radishes for variety, and then I remember that I am going away in less than a month and it would be better not to plant anything until I can be here to tend the garden. I think about what I need and what I don’t need. At certain points in unpacking I declare “I don’t need any more stuff.” Then I realize I haven’t seen my set of biscuit cutters (“Maybe they are in the cookie-cutter tins by the kitchen bookshelf”) or my dough cutter. Because two of my bookshelves sit in the kitchen as a makeshift pantry and china cabinet respectively I have to edit the books that I display on the bedroom shelves. Last time around I consigned the short story collections to the shed. This time I have them out, but I am thinking they will be boxed up once again so that I have room for music books and volumes of poetry. Another strategy is to place books I have bought but have not yet read on a high shelf and to ask Johnny, who is tall, to get them down as I need them. Tomorrow, my “day off” I will face the book-sorting issue: last time I rearranged the books three times before I was satisfied. When I spill water on the floor I am full of desire for a new, more effective mop and a large batch of cotton rags. When I think of making soup I covet an immersion blender, or, at least, a working regular blender. When I bake bread in conjoined loaf pans I remember the nice set of bread pans I saw at a thrift store in Berkeley and wonder if they are rust-proof and if they are still there. I make mental lists of groceries: whole wheat flour, lemons, sour cream, cinnamon sticks. Whenever I put something away in some inconvenient place I think, “Is there a better place for that in the kitchen?” (or the bedroom, or the bathroom). As per the last time I moved I cannot find my camera battery on the evening that I write this blog post. If I find it soon I will perhaps add some pictures of the tomato forest. Stir constantly until cornmeal thickens and bubbles. Pour into mixing bowl. In a glass measuring cup, measure 1 and 1/2 Tbsp of corn oil or soft shortening. Add to cornmeal mixture. In that same greasy measuring cup, pour 1/3 cup molasses. Add molasses to cornmeal. DO NOT WASH THAT CUP YET. Into that molasses-smeared cup, put 1/4 cup water. Pop it in the microwave for a few seconds until lukewarm and add 4 and 1/2 tsp yeast. Stir with a fork until the yeast dissolves. In another bowl measure 4 cups sifted flour. Either go away and leave cornmeal mixture to cool to lukewarm and then add dissolved yeast OR start adding flour to the cornmeal mixture, which will help cool it. When the mixture is lukewarm add the rest of the flour and the dissolved yeast and begin to knead the dough. You may have to add more flour to overcome the stickiness of the molasses. I like to turn the dough out of the bowl and knead it on a lightly-floured wooden surface. When the bread is smooth and no longer sticky, add 1 Tbsp butter or oil or shortening to the mixing bowl and place the dough in it again. Cover with a dampened and warmed linen or cotton towel and leave to rise in a warm place until doubled (over an hour). Punch down. Let rise again (about half an hour). Grease a bread pan or pans and shape dough. This recipe makes a good-sized round loaf or four small loaves. Preheat oven to 375 Bake for forty to forty-five minutes until nicely browned. Remove loaves from pans and let cool before slicing. January 2015 got off to a slow start. I got sick around the twentieth of December and could not recover. I spent a lot of time in bed, sleeping and sipping fluids. After three weeks I got around to seeing a doctor and received a short course of antibiotics. Just as those began to take effect I had a minor incident with a guitar stand and was ordered to another five days of bed rest. Heavens! My sweetheart supplied me with a copy of I’m Your Man: The Life of Leonard Cohen to read while I elevated my bruised but not broken right foot. He also made me cups of tea, heated up food for me and took me to the movies to see “Selma.” Pretty good deal, I say (and no, he is not available and does not make house calls). After the guitar stand incident and before the bed rest Johnny and I managed to make my first video, a recording of my song “Clueless,” to enter in N.P.R.’s Tiny Desk Concert Contest. You can watch it here. And, of course, I’ll be happy to sell you a copy of the “Clueless” CD or my earlier recording “Paris.” The “Clueless” CD is particularly nice for Valentine’s Day gifts because it consists of three love songs, one about the exultant, swooning feeling of falling in love, one about doubts and fears and family history, and one about the mishaps and misunderstandings inherent in courtship. Short and sweet this month. 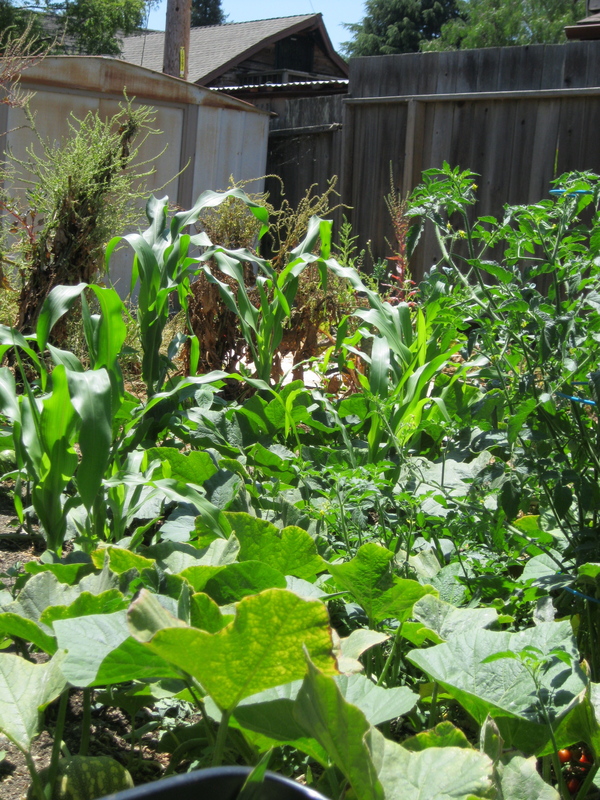 I am clearing away the detritus from my San Leandro garden and anticipating what to plant in February or March. Enjoy the video. And thanks for reading. Please excuse the hyperbole — I am practicing supporting my music with better marketing efforts. As I mentioned in the November post I took part in Maia Duerr’s course “Fall in Love with Your Work” this fall for the second time. The signal realization for me this time around was that I had wanted to become a performing singer and songwriter at age eleven and that I still wanted to do that. Maia gives students in this class an opportunity to sell work on the Liberated Life Project Marketplace website, which inspired me to create, “Clueless,” a new EP (reduced length CD) of three original love songs I had written in 2012. “Ingenue” describes the experience of falling in love despite “a lifetime of love gone wrong.” “The Werewolf” talks about “the alcohol werewolf blowing my safe house down,” worrying out loud about potential problems in a desired relationship and “Clueless” details mishaps of courtship where both participants trade off being “clueless” by not understanding one another, not picking up hints, etc. That one, like “Ingenue” has a happy ending — it is always a positive, enlarging event to fall in love because it opens the heart. This new E.P. marks the first time I have released a recording of all original material. I might as well be known as Sharyn Don’t-Call-Me-a-Singer/Songwriter Dimmick because I am always saying that. As a songwriter, I value my own material and I sing it myself, which technically makes me partly a singer/songwriter, but, as a singer, I like to sing all kinds of songs, from traditional Scottish and American ballads, to hymns and Christmas carols, to 19th century classics like Stephen Foster’s “Hard Times” to iconic songs like Joni Mitchell’s “Woodstock” and Bob Dylan’s “Don’t Think Twice, It’s Alright,” to lesser-known contemporary gems like Shelley Posen’s “No More Fish, No Fishermen,” a lament for the decline of the Newfoundland fisheries. Because I wanted to present some new music this year and because the songs on the “Clueless” album hang together well I decided to release them as a solo acoustic project, an album with no overdubs or guest musicians. My previous recording, “Paris” covers a wider scope of my musical interests. The inspiration for that recording was the title cut, also called “Paris.” When someone I thought might be more than a friend took off for Paris without me and did not send me so much as a postcard from the trip a song was born as I mulled over every visit I had made to the City of Light, from a hitchhiking trip when I was twenty to a visit to a lover’s family in the 1990s. 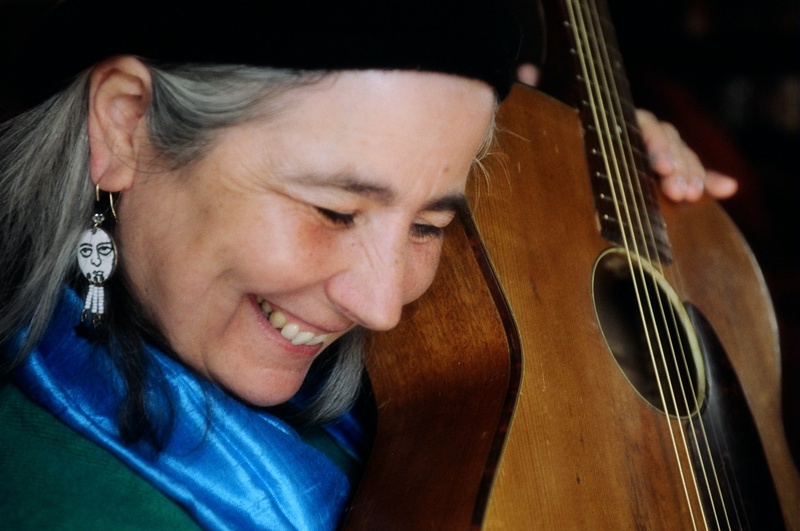 When I wrote the song I knew I wanted people to hear it, including my zen and writing teacher, Natalie Goldberg — I figured if I put it on a CD she would have to listen to it. * The recording features two other original songs, “The Wallflower Waltz” and “Morning Shanty,” which I had recorded previously on a cassette recording called “I Am Your Winter Lover” in 1998. I filled out the CD with songs I had known and loved since childhood: “Barbara Allen,” “Bringing in the Sheaves, ” “Big Yellow Taxi” “When You and I Were Young, Maggie” and “The Battle Hymn of the Republic.” I sandwiched “The Battle Hymn” between Richard Thompson’s “We Sing Hallelujah” and Leonard Cohen’s wonderful anthem “Hallelujah,” recording the three songs as “The Hallelujah Trilogy,” backed by a group of singers I called “The Hallelujah Chorus.” I also employed musicians to add fiddle, banjo, second guitar, concertina and harmony vocals to some songs, and dubbed in my own harmony parts on others. I am pleased to announce that Bay Area readers (or those traveling through town) will have an opportunity to meet me and to hear my music in a live performance at the December 12 Open Mic at the Berkeley Fellowship of Unitarian Universalists, 1606 Bonita St.. I will be the featured performer for December and will sing a 20 minute set. If you are in town, please come to hear me. You might even be able to take home a copy of the “Clueless” EP. I will also be singing the Scottish ballad “The Bonnie Banks of Fordie” on the radio this week on “Traditional Ballads with Sadie, streamed at www.kggv.blogspot.com or live at 95.1 FM on Thursdays 7:00 to 8:00 PM Pacific Time. 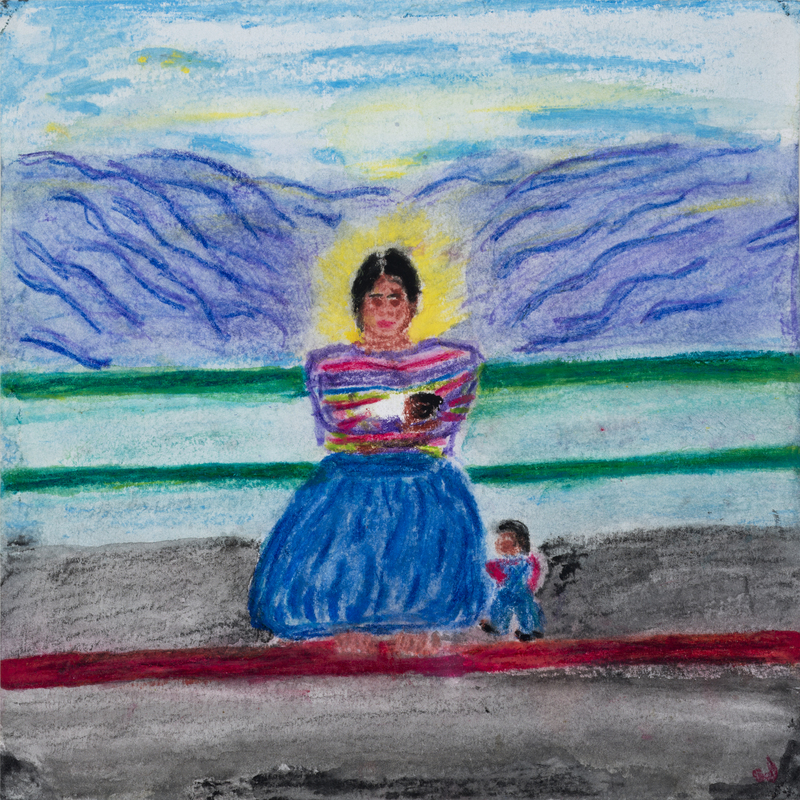 Be sure to check out other offerings from the Liberated Life Project Marketplace. Here Jill S. talks about her lovely note cards of architectural details and dahlias. * After the “Paris” CD was released, Natalie confessed to me that she only listened to the tracks she liked best and skipped the rest. I extracted a promise that she would listen to the entire CD. She did and then wrote me a lovely review on CD Baby. Later she featured the lyrics to “The Wallflower Waltz” and stories about me in her book, “The True Secret of Writing.” She has continued to be a staunch supporter of my music and a good friend. Johnny made the first move: he called me from the hospital on the evening on October 6 to say that the silence between us was over. Two days later he expressed the hope that we could become friends. I spoke about my sadness at this idea and asked for a little time to process it. Then I went to see him in the hospital the next day after little sleep, many tears and several conversations with friends. We did not discuss our relationship that day, but talked about songs and such. I was afraid that I would suffer from unfulfilled longings if I tried to become friends with Johnny. In our next long conversation I asked if he would share with me his reasons for deciding we weren’t right for each other. He did so and we talked about each one in turn, not trying to resolve things, but discussing his concerns. As time passed I became less afraid: I reminded myself I didn’t control outcomes, that all I could do was be honest and present. I adopted the attitude that I could just take things a day at a time, see what happened each day, take responsibility for my part in present and past interactions. Then one night I called Johnny to ask for some advice about sequencing the three songs on my upcoming “Clueless” CD. I had chosen the songs, arranged them and practiced them for a couple of months preparatory to going into the recording studio. 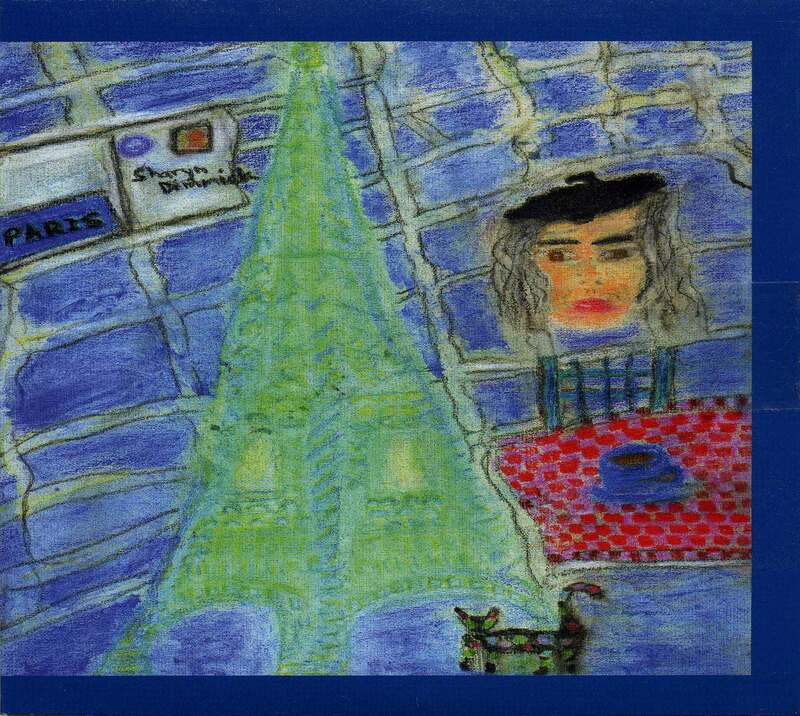 I had made a painting for the front cover, featuring a self-portrait with two-tone hair and a portrait of Johnny. Johnny gave me his opinion about the order of the songs, all of which I had written in 2012 when I was falling in love with him (My personal notation for them is “sweet song,””scary song,””funny song” and, collectively, “The Johnny Songs”). Later I decided to put them in a different order and he told me he had independently come to the same conclusion. Checking in as I went, I continued to discuss the music project with Johnny. I called him right after I left the recording studio the first day to tell him that we had gotten two takes of each song in an hour and a half. He asked me to play them for him over the phone, so I turned my computer speakers way up and held my cell phone to a speaker. Johnny listened and made comments, telling me which tracks he preferred and why. He also identified several potential problem notes in one song and I wrote them down to check with my recording engineer the next day. When I completed the recording and mixing I felt frustrated that I couldn’t play the master for Johnny, but I had come down with a slight virus and needed to rest. Our many conversations revealed to us how much we cared for each other. Working on my music project together reminded us how well we could work together as a team. It is not that we are in a hundred percent agreement with each other, but we listen and genuinely want the best for ourselves and for each other. Johnny, who had felt torn between his attachment to me and his objections to certain behaviors and traits of mine, came to choose our great affection for one another over his objections. He said that he let go of his concerns about our differences and found more room to love me. I had let go of him earlier in the summer, but it did not affect my love for him, only the form that that love might have taken: I am grateful that he opened up the conversation again, which allowed us to come back together. We announced the renewal of our commitment to one another in classic modern fashion — by changing our Facebook status. One lesson I learned along the way is that the relationship I have with Johnny is between me and Johnny: I can ask other people for opinions, but no one else casts a vote in the relationship. As I say in the song, “Clueless”: “You might be a clueless woman. You might be a clueless man. ‘Cause love has been confusing ever since the world began.” Love has been confusing and difficult, even wounding, but love finds its way through life’s obstacles if we apply enough patience and self-awareness, and loving, after all, is what we are here to do. Yesterday I went out to see Johnny and paid a visit to my former vegetable garden, which has only gotten wilder. When I looked out the back door I saw a field of tomato blossoms covering the entire paved area. Buried in the understory were a whole colander’s worth of Principe Borghese and Sun Gold tomatoes. The tepee of Scarlet Runner beans was still standing and the pods were dry — I picked all that I could find. I carted home more butternut squash of varying sizes, leaving green ones and blossoms still on the vines that took up the other half of the yard. Chard had reseeded itself and the kale had never died. I picked leaves from both plants. I have plans to make a butternut squash lasagna with bechamel, perhaps this weekend. The bounty reminds me of the harvest festival aspect of Thanksgiving and the crazy weather in California that has squash and tomatoes blossoming in November. 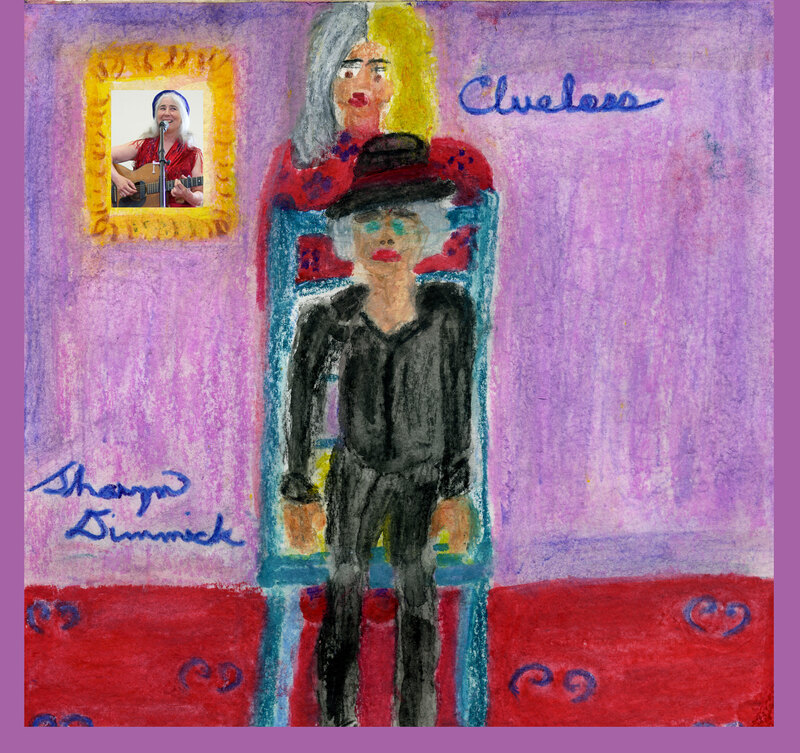 As December approaches my new E.P., “Clueless,” is at the manufacturer’s, awaiting the final draft of the cover and CD art. When I receive the discs I will make a special announcement here. You will be able to order CDs from CD Baby or from Down Home Music in El Cerrito or from me directly or from the Liberated Life Project Marketplace. The Marketplace will operate for a limited time from November 30 2014 through January 2015 and will feature gifts and services by a diverse selection of artists, musicians and other professionals. 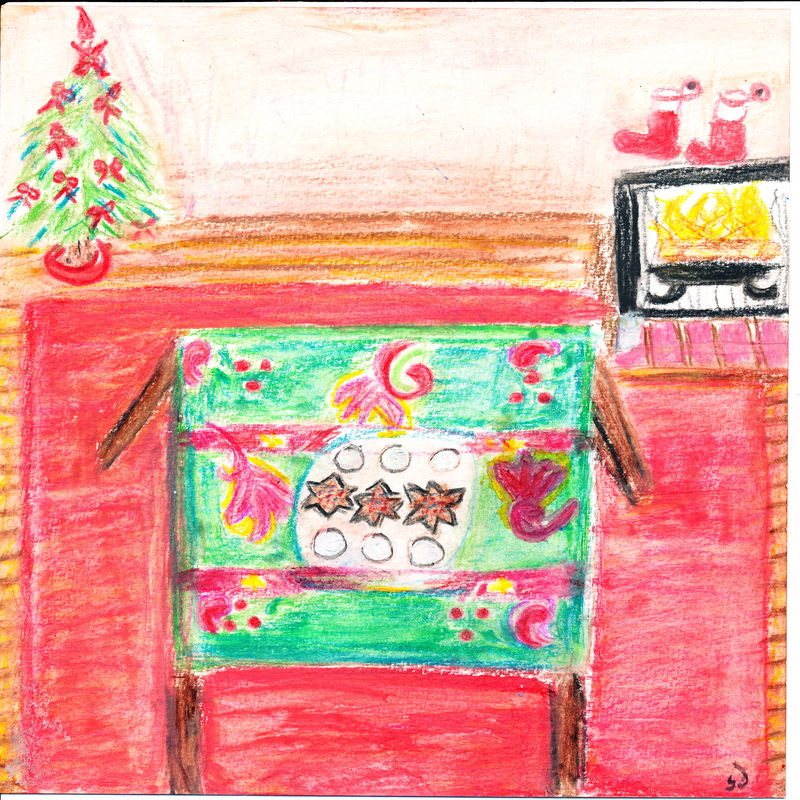 Look for cards, metal sculpture, a book about happiness, coaching sessions, classes and more. Buying gifts or services in the Marketplace supports independent artists like me and people who are aligning their lives and their values to offer you the best that they’ve got. Check it out. I am thankful every week and every month and every day for those of you who continue to read The Kale Chronicles as it transforms itself again and again.